I’ve been guilty of these, have you? The Passion Flower (Passiflora) needs one thing above all else- sunshine. So a south facing wall is really the only place where it will succeed in most parts of the U.K.- it must be open to the sun all day. If your location is right the other issue might be an over rich soil- this can produce a mass of foliage and stems at the expense of flowers, so if you’ve been feeding it perhaps lay off for a while and then make sure you use a feed rich in potassium (e.g.dilute tomato feed), which will encourage flowering. As for the Wisteria, this is one of those plants that takes a fair while to come into flower. to make the wait even more agonising, it often grows very little in its first year or two. Help to induce flowering by shortening any unwanted long stems in July or August, cutting them back to about 30 cms or to 5 or 6 buds, and prune again in January, shortening all side shoots back to two or three buds, so concentrating the plant’s energy into a limited number of flowering buds. Again, an occasional feed with diluted tomato feed (or another feed rich in potassium) can also coax flowers from reluctant plants. My own experience from transplanting a Wisteria seedling to my arbour in my Kitchen Garden, is that it’s taken a good five years for it to flower in any profusion, but I think the mild winter and warmish spring have also played a part- below are some pictures of how it looks today. I’m gradually training it over the top and sides of the arbour. You might also find this article about using climbers in the garden useful. Coincidentally my younger daughter (who lives in a basement apartment in the outskirts of Lisbon,Portugal), has just bought a Wisteria to go alongside a very successful Trachelospermum jasminoides she and her husband planted about 3 years ago (I’m told the fragrance just now is wonderful). I’ve suggested they train it along wires fixed to the walls of their patio garden and as it’s in a container to give it a fortnightly feed of tomato food to encourage flowering. Fingers crossed! If you have any questions you’d liked answered then email me and I’ll do my best to feature your question and hopefully provide an answer! My email address: nbold@btinternet.com, and put ‘GQT question’ in the subject line, please. GQT: Lawns – What is meant by ‘Top Dressing’, what should I use and how do I apply it? I thought I’d offer to (try to) answer any gardening queries you have as a regular blog feature on Old School Garden. In the comments on my recent review of the blog, several people mentioned the value of the gardening tips I include in some of my posts, so I thought I’d try out something a bit more focused and regular – a sort of ‘Gardeners’ Question Time’ (or GQT for the initiated!). I was prompted to do this by a book I came across the other day, whilst rummaging in my local charity shop (a great place to pick up gardening books, I find). Though about 20 years old it still seems to ‘pack a punch’ so I’m going to use it to kick off the GQT series! It’s called ‘1000 Handy Gardening Hints’ and covers a wide range of topics, so hopefully it should be useful to someone out there in blogland! Top dressing usually means applying a fertiliser, particularly a nitrogenous one, to the surface of soil bearing a crop, usually in concentrations of about 18 grams per square metre. 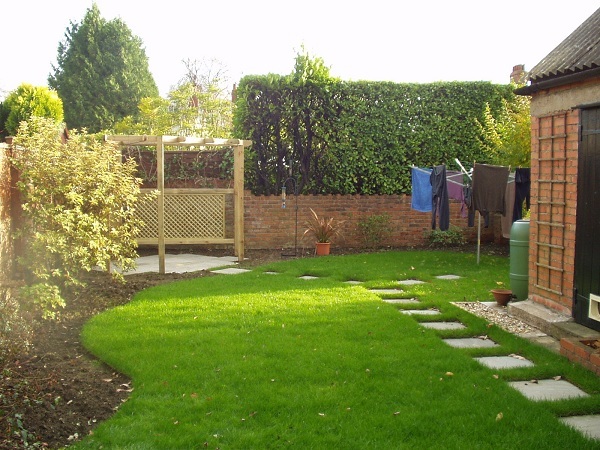 In lawn management top-dressing means the application of suitable ‘bulky material’ to the surface of the lawn at the rate of 1 – 3.5 kg per square metre. The material should ideally be a made up or ready-made compost (of 6 parts medium grade, lime free sand to 1 part granulated peat or other organic material and 3 parts topsoil). This should be well worked into the lawn by means of a drag brush or ‘lute’ to make the surface smooth. I remember my Dad (who was the Green Warden at our local Lawn Bowls Club around 50 years ago) spiking the grass surface before hand to provide some holes into which the top-dressing could be brushed (I also remember helping him to do this as an enthusiastic youngster!). Whilst this fed the grass it also helped to improve aeration and drainage. Top dressing can also help to even out dips in the surface. If you want to get the ‘Bowling Green ‘ effect, now is the ideal time to be applying top-dressing to your lawn! Here’s a video that you might find helpful. So that’s the first session of ‘GQT’ – what did you think? I’ll try out a regular weekly session, so if you have any questions you’d liked answered then email me and I’ll do my best to feature your question and hopefully provide an answer! A new report charting the numbers of moths in Britain over forty years makes grim reading. Climate change and habitat loss are driving some to extinction – especially in southern Britain. Moths are perhaps not as popular as butterflies. But they are an important ‘indicator’ of how our native ecology is faring, a significant pollinator and source of food for birds, bats etc. Whilst many are subtly coloured, others are as eye-catching as their cousins. The Butterfly Conservation report says that two-thirds of common and widespread larger species of moth (macro-moths) declined in the last 40 years, most seriously in southern Britain. The report suggests that the decline in habitats through development and agricultural practices are the factors behind the decline in the south, whereas it sees climate change (a gradual warming) as a key factor in the broadly neutral results in the north – declines in some species have been matched by increases in others. And climate change is also the explanation behind the growth in new species in the country. More than 100 species have been recorded for the first time in Britain this century and 27 species have colonised Britain from the year 2000 onwards. However, the report says that three species have become extinct in the last 10 years and three more are at serious risk of extinction, having already declined by more than 90% in the last forty years. What can gardeners do to create the right habitats for moths? The Royal Horticultural Society makes several suggestions about planting. It’s also important to provide food for caterpillars with plants such as Clarkia and Fuchsia. leaving a ‘wilder’ area of the garden with longer grasses, thistles and knapweeds will benefit smaller moths. Many native trees, hedges and ornamental plants also provide food sources fo moth caterpillars.